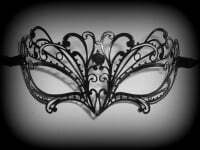 Beautiful Black Filigree Metal Venetian Masquerade Mask For Women. 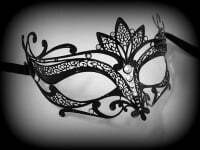 With black satin ties for maximum security & comfort this Leda mask is simply perfect. Chic, timeless & wonderfully elegant, this Leda Filigree Masquerade Mask fuses classic design with an inspired contemporary finish. 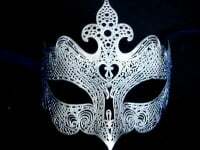 Designed in glistening nero black, this gorgeous piece is a really beautiful designed and handcrafted filigree mask for women who demand to be seen.....Stand out for your feminine style with this fabulous mask, guaranteed to make you stand out from the crowd. With black satin ties for maximum security & comfort this Leda mask is simply perfect.